Pros A must-have for serious coffee drinkers thanks to prolonged heat retention and a durable mesh plunger that removes coffee grounds -- not taste. Cons A bit of an investment in terms of price. 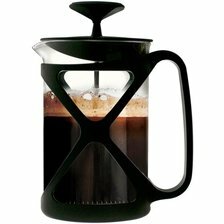 Summary Hands down the best French press on the market right now. No other unit produces such high-quality results and consistent flavors. 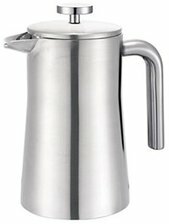 Pros Garners praise for its heat-resistant carafe, which keeps coffee warm for extended periods of time. Cons Users occasionally find coffee grounds in their coffee. Summary Outperforms much pricier units. The Bodum delivers precise extraction and durable construction. Flat Screen TV stand sold separately. See all TV stands. Flat Screen TV mount sold separately. See all TV mounts. TV audio equipment sold separately. See all Home Theater Systems. HDMI cables sold separately. See all HDMI Cables. Accessories sold separately. See all Accessories. Pros Stands out for its large handle, which promises effortless pouring. Cons The glass carafe is prone to breaking. Smaller capacity than other models. 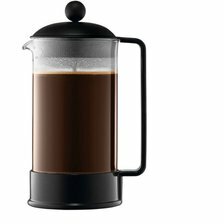 Summary Despite its attractive price tag, quality issues make this French press a gamble. 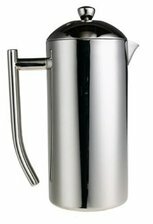 Pros We appreciate its generous capacity and modern brushed stainless steel finish. Cons Difficult to clean -- especially the stem. Summary It looks great, but less expensive French presses offer very similar performance. Pros A top choice for its double screen system, which keeps every last coffee ground out of the coffee. Very affordable. Cons Glass feels a bit thin. Summary The SterlingPro continuously yields robust, tasteful cups of coffee. It's also easy to use. Undoubtedly the best bang for your buck.